For most business owners, there is very little separation between business and life. While this is a necessary mindset to have when navigating the challenges of entrepreneurship, it does make for a jolting transition when it all reaches a ceasing halt. 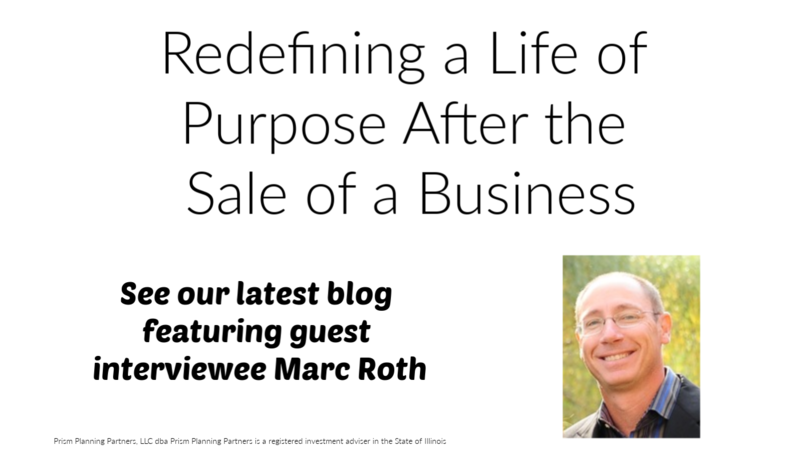 There is life after the sale of your business – and as we learned in our interview with successful business owner Marc Roth, the new life you create may be refreshingly fulfilling in ways you never imagined. Prism Planning Partners: Marc, when you sold your business in 2012, what was your vision for what you were going to do afterwards? Marc Roth: Prior to the sale, I had journaled quite a bit about the reasons behind selling. I looked at who the stakeholders were – myself, my family, my partners, my employees, and clients – as well as the “why” and “why not” behind the decision. When I sold the business, I was somewhat burnt out. Right after the sale I was looking for a sabbatical. Looking back, it was far different than what someone might expect from time off. I’d take two months to a year, I thought, and then go back to doing whatever I was doing. The last sixteen years I had spent most of my time running the business using my left brain (logic and reasoning). Post-sale, I envisioned exercising the right side of my brain (creativity and intuition), nourishing more creative interests such as playing my guitar and writing. When I was done with that “clearing” period, I woke up one day and found that there wasn’t a business there anymore. I knew going into this, but hadn’t overly contemplated, the fact that most of the areas of my life that were providing me with great fulfillment were all housed in one place – and that was my work. Most of my philanthropy and leadership were generated through the workplace. It encompassed most of the learning I was doing, the skills I could apply, all of my income, and financial wellbeing. All of the things I measured success by were tied into my work. Leaving the workplace left me with voids in a lot of those areas that I yearned to rebuild elsewhere unless I went back into another business and surrounded myself with the same situations. That wasn’t something I had any great intention to immediately do. Prism Planning Partners: And what happened next? Marc Roth: I had already been involved with some philanthropy but took a more active role in the subcommittees of some of the boards I was involved with. I found it – and continue to find it – extremely fulfilling. Yet, while the fulfillment I’ve gotten from the boards has been very rewarding, it hasn’t equaled the effectiveness from the philanthropic efforts at work, such as creating jobs, mentoring and coaching people to build their careers. It’s not that what I’m doing isn’t fulfilling. Looking back, I just feel like my contribution is more valuable by helping people grow, such as students from Stevenson High School, Kellogg and folks from the community. Prism Planning Partners: So, what’s in store next? Marc Roth: My attitude towards being a business owner has drastically changed from what it was. The story I’m telling myself is that I was and am meant to be a business owner and leader. The difference between then and now is the source of my motivation. When I started my business, I was motivated by feeding my family and survival. The fear was of failure: what would I do if the business failed? I couldn’t imagine what I would do. I didn’t see myself as having skills outside my business. After selling the business, I got a strange sense that I traded in all the wonderful relationships and unique elements involved with running a business for cash. The cash was safety. It’s an important component in my tool belt to protect my family, ensure there is a roof over our heads and that the kids go to college, etc. In exchange for that, I inadvertently lost the “Petri Dish” that served as a platform for personal and professional growth. I’ve been trying to rebuild that with individual parts and/or find another business or businesses to fill that gap. But to be honest, I’m not sure I want to give up all this freedom that I found. I don’t want to start just any business that may or may not have meaning to me, working with people I may or may not like. So, I’ve been looking at businesses for the last handful of years and strategically investing in them taking a minority interest, or sometimes more. I’ve worked with businesses where I respect the people, share their vision of what it could become, and believe that I could add some value whether it is strategic, operational, or capital. I have found that I underestimated how difficult it can be to find that unless I start it completely from scratch myself. I’ve looked at more than 50 businesses over the last several years. It’s a business to find businesses. Maybe that’s because my criteria are tighter now that I have choices. Prism Planning Partners: So, is going back to “the Petri Dish” off the table? Marc Roth: Much like my first adventure, I’d prefer not to do it all by myself. To me that would be lonely. The best part of the journey was doing with people I loved and respected. Playing a primary role in a startup business from scratch again is something I do consider, but it’s largely driven by finding the right people and near perfect opportunity. Ultimately, I’d rather get involved with something that’s already moving. There is a certain amount of time that it takes, about 3 years, before you get to the point where the business is really moving, and you can start to accelerate. I guess I’m more interested in starting from a point of momentum than ground zero again. It would have to be an awfully special situation for me to want to go back and work 50-60 hours a week. I wouldn’t want to give up my freedom. Freedom is addictive. I’m not sure I would trade that in for money but maybe for a journey that seems super exciting or a group of people I’d be really excited to work with. As you can see from Marc’s story, the sale of a business isn’t just a financial change. It can enrich your life – and the world around you – in ways that go far deeper than the dollar signs. Are you considering the sale of a business? Contact us and we would be glad to provide you with ideas about how to stay whole both financially and mentally in light of this transition.